So you can speak Canadian English, eh? Speaking English like a Canadian can be as exciting as the country itself. “Canadian English” or “Canadianism” includes a wide spectrum of words and expressions that are native to Canada. Canadianism comprises of phrases coined from words that unique to the Canadian vocabulary. Moreover, it is coupled with the distinguished Canadian slang and pronunciation. Hence, it would be wrong to comprehend the language simply as a blend of American and British English with some Canadianism sprinkled over it. Canadians borrowed the lexeme, but allowed it to regenerate uniquely. It is interesting to learn that many words of Canadianism are the compositions of early settlers. Words were borrowed or coined to describe or label the landscape, nature, surroundings, flora and fauna. In this manner, words like saults, buttes, kinnikinnick, saskatoon, caribou, wapiti, kokanee, turkey vulture and whiskey jack came into existence. Canadian English is significantly different from American English. For example, Canadians pronounce the last letter in the alphabet series as “Zed” like British English, unlike the American “Zee”. When it comes to pronunciation, Canadians continue to pronounce certain words (eg. mobile, fertile, fragile) in the British speech. Likewise, you can spot certain words like ‘colour’, ‘catalogue’, and ‘organise’ that are spelt in the British way. Alternatively, Canadianism follows American spellings for some words like ‘tire’ and ‘draft’, rather than the British spelling as ‘tyre’ and ‘draught’ respectively. Moreover, in some instances, the same expression can possibly carry opposite meanings in Canadian and American English. In Canada, ‘to table a document’ means to present it; whereas in the US, it means to discard it. 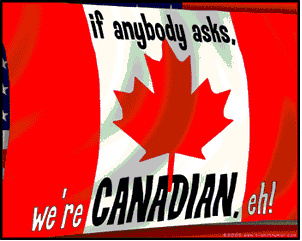 In Canada, you are sure to prick up your ears to hear the ‘eh’ at the end of many sentences. The pronunciation of ‘eh’ may differ according to the usage at the end of a statement or a question. It is synonymous to the American usage of ‘yeah’ and ‘you know’. Canadianism is always evolving, especially in the major cities of Canada. The blend of Canadian culture with immigrant languages influences the creation of street slang. Canadian slang include words and phrases that are exclusive to the region. Canuck is a slang term that is used to describe Canadians, especially French Canadians. Vancouver Canucks, the country’s best hockey team, stands testimony to the Canadian slang pride. 9. Lord Stanley — Refers to the Stanley Cup, which is awarded to the National Hockey League Champions. Thus, the Canadian slang is truly unique and it is an integral part of the overall culture. The slang also extends to include locations, scenarios and objects of daily use.